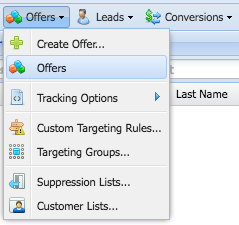 This will list all the Offers. Click on the Offer Name to pull up the Offer Window. 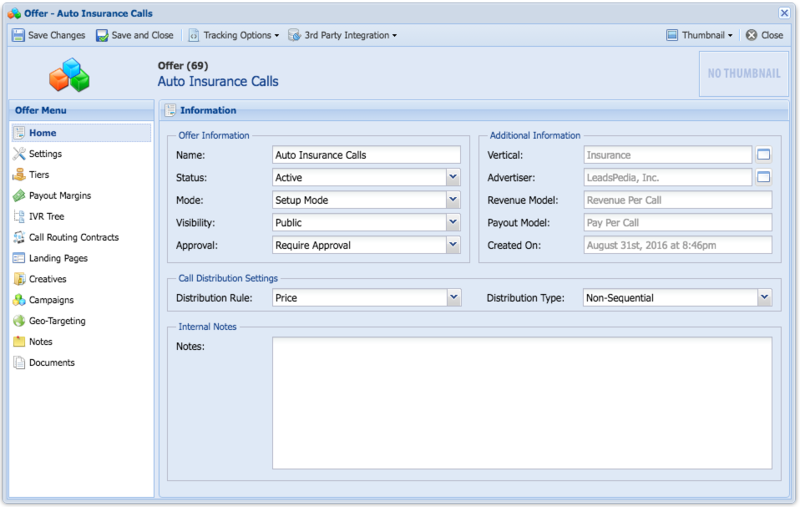 The Call Distribution Rules can be managed under the Call Distribution Settings. Price: The calls are routed based on the highest price. The platform will attempt to transfer the call to Contract B. If the call fails transfer, then the Platform will attempt to route the call to Contract C.
If the the call fails again, then the platform will attempt to route the call to buyer A. Priority: The calls are routed based on the Contract Priority. The platform will attempt to transfer the calls to Contract C and only if the transfer fails, then the platform will attempt to transfer the call to Contract A. If the transfer fails both Contracts C and A, then the platform will attempt to transfer to Contract B. Weight: The calls are routed based on the daily transfer weight of the Contracts. The first two calls will attempt to transfer to Contract A. The third call will attempt to transfer to Contract B. The fourth and fifth calls will attempt to transfer to Contract A. The sixth call will attempt to transfer to Contract B. Note: If the first call or the second call fails the transfer to Contract A, then the platform will attempt to transfer the call to Contract B. Simultaneous: Dial all Contracts in the Offer. The call will be transferred to whoever picks up the phone first. The platform will attempt to dial Contract A, B and C at the same time and whoever picks up the phone wins the Call. Round Robin: The calls are routed equally to the Contracts as they come in. The first call will attempt to transfer to Contract A. The second call will attempt to transfer to Contract B. The third call will attempt to transfer to Contract C.
The fourth call will attempt to transfer to Contract A.
Sequential: If the first advertiser does not pick up the phone or the ring timeout exceeds the ring timeout settings, then the platform will attempt to dial the second contract and so forth..
Non-Sequential: If the first advertiser does not pick up the phone, then the platform will not attempt to dial another advertiser.